We recently took a road trip down to Funks Grove, Illinois. Funks Grove (via Wikipedia) is: A historic unincorporated community on U.S. Route 66 in McLean County, Illinois, southwest of Bloomington. The grove for which the settlement is named is a National Natural Landmark. Around 1824 a man named Isaac Funk settled in this area. The Funk family started selling "sirup"--yes they spell it that way--and continue to sell it today (I have some in my refrigerator). It is so popular that you have to know when they are processing it and get on down to grab some or you'll miss out. Visit the sirip store in the off season and you just might get a private walk through of the processing area by one of the family members. Funks Grove is a gorgeous forested area with year-round beauty and home to abundant wildlife. People don't think we have much in the way of fall color out here in corn and soy flat country but we do! Blue skies and the shades of orange and red are rampant in our area and Funks Grove is a treasure trove and quiet little secret enjoyed by everyone who visits. The trees were just starting to change and drop their leaves. 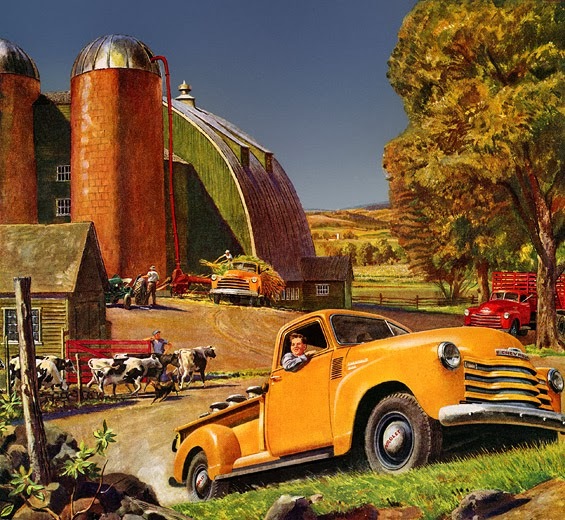 Warm fall days like these are just made for old Chevy trucks and this vintage Chevy advertisement proves that. There is something about driving with the windows down and hearing the crunch of fall leaves under the tires that makes everything right with the world. Chevy tough and still bringing joy to people decades later! I like to imagine Abbey on her farm long ago doing what this truck is doing.